BC Women’s Hospital & Health Centre is one of Canada’s largest maternity hospitals with approximately 7,000 babies born here each year. Many of the programs run in close partnership with partners such as BC Children’s Hospital and Perinatal Services BC. BC Women’s Hospital is the largest tertiary care hospital in Canada to be designated Baby-Friendly, demonstrating a commitment to enabling mothers to breastfeed their newborns. BC Women’s Hospital offers a range of services for women during and after pregnancy. BC Women’s hospital provides all levels of maternity care, including care for women with both high and low risk pregnancies. 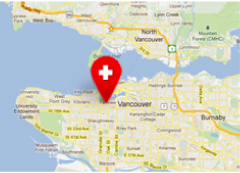 All women who live within the City of Vancouver can choose to see a family doctor at BC Women’s Hospital for their prenatal care. If you live outside Vancouver, you must be a long-term patient of a BC Women’s Hospital doctor or have had a previous birth at BC Women’s Hospital. The Maternity Centre at St. Paul’s Hospital is a family-centred service where approximately 1,800 women from around the Lower Mainland choose to deliver their babies each year. Guided by the principle “How you want to be treated.”, the Maternity Centre provides comprehensive maternity and neonatal services for both low-risk and high-risk mothers-to-be and newborns.